I remember when craigslist was just a coastal thing. Earlier in the decade when I lived in NYC, I got ALL of my apartments on craigslist. But when I would tell people back home about it, they didn’t know what I was talking about. Now, everyone probably knows someone who’s sold a guitar, found a roommate or bought a car off of craigslist. The site now has a presence in almost every region of the country, and they are literally taking over the classifieds business nationwide. One of craigslist’s best features has always been the job search (and resume post). Dead simple and dead ugly, but affordable and very, very effective. 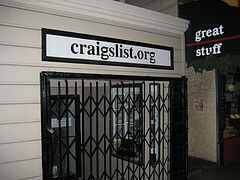 In fact, craigslist has long had the reputation as the most effective job board. Anyhoo… one of the (very few) drawbacks to job search on craigslist has always been that it’s hyper-local. I mean, by its very nature, each craigslist site is self-contained around a particular locality. This has made performing a nationwide or every regional job search very difficult. Quite simply, it allows you to search for jobs across multiple regions in one place. I’d go into extended detail explaining how to use the site, but I don’t really need to. Like craigslist, crgslst.com is very barebones and very easy to use, to the point of being self explanatory (note to web developers, THIS is how you use AJAX in a helpful, seamless way). You enter a keyword, select cities and regions, and quickly search back and forth across multiple craigslist domains. You can even save jobs you like in a little shopping-cart like storage area on the right. Check this out immediately if you want to do a nationwide job search using craigslist. It’s barebones all right! It looks like it isn’t reay yet for production and needs a lot of work. There are some sections where you can’t read the words! Really? I tried it out and it worked perfectly! I was really impressed. Anyone else have this problem? crgslst.com has been blocked by craigslist. Why? All craigslist would have to do is offer a way to achieve the same results, not block the efforts of a site that does something craigslist does not do.